Abstract: Field relations and deformation structures in the southeastern part of the Pohorje Mountains constrain the tectonic evolution of the Austroalpine high-pressure/ultrahigh pressure (HP/UHP) terrane. The Slovenska Bistrica Ultramafic Complex (SBUC) forms a large (ca. 8x1 km size) body of serpentinized harzburgite and dunite including minor garnet peridotite and is associated with partly amphibolitized eclogite bodies. The SBUC occurs in the core of an isoclinal, recumbent, northward closing antiform and is mantled by metasedimentary rocks, mostly gneisses and a few marbles, including isolated eclogite/amphibolite lenses. Before this folding, the SBUC formed the deepest part of the exposed terrane. We interpret the SBUC to be derived from near-MOHO, uppermost mantle which was intruded by gabbros in the subsurface of a Permian rift zone. During Cretaceous intracontinental subduction, the SBUC was most likely part of the footwall plate which experienced HP to UHP metamorphism and was folded during exhumation. In the Miocene, the Pohorje Pluton intruded and, subsequently, the metamorphic rocks together with the pluton were deformed probably due to east-west extension and contemporaneous north-south shortening, thus forming an antiformal metamorphic core complex. Abstract: Two new genera and species Abropelecinus annulatus gen. et sp. nov. and Azygopelecinus clavatus gen. et sp. nov., placed in the subfamily Iscopininae of the family Pelecinidae, are described and illustrated. Sinopecinus viriosus Zhang, Rasnitsyn & Zhang, 2002 are re-described. All these male specimens were collected from the Yixian Formation of Beipiao City, Liaoning Province, northeastern China. A key to the male species of the subfamily Iscopininae is given. In addition, sexual dimorphism in Pelecinidae and the paleoclimate of the Yixian Formation are briefly discussed. Abstract: Eoalpine very low- to low-grade metamorphism related to Cretaceous orogenesis has been investigated in the Slavonian Mts, Croatia. Samples belonging to the Psunj metamorphic complex (PMC), the Radlovac metamorphic complex (RMC) and Permian-Triassic and Triassic sedimentary sequences (PTSS) were studied. The Kübler and Arkai indices of all the analysed samples indicate high-anchizonal to epizonal metamorphism. The degree of Eoalpine metamorphism tends to be constant in all samples implying that the different complexes passed through and recorded the same event. Measurements of illite-white K-mica b0-parameter of the RMC samples imply transitional low- to medium-pressure character of the metamorphism. These data together with K-Ar ages (~100–80 Ma) measured on illite-white K-mica rich <2 mm grain-size fractions point to Late Cretaceous very low- to low-grade regional metamorphism presumably related to the main nappe-forming compressional events in the Pannonian Basin and the Carpathians. The P-T-t (pressure-temperature-time) evolution of the studied area is in good agreement with similar scenarios in the surrounding areas of Tisia, but also in Eastern Alps, Carpathians and Pannonian Basin (ALCAPA). Abstract: Recently shot 3D seismic data allowed for a detailed interpretation, aimed at the tectonic evolution of the central part of the Mid-Hungarian Shear Zone (MHZ). The MHZ acted as a NW vergent fold and thrust belt in the Late Oligocene. The intensity of shortening increased westwards, causing clockwise rotation of the western regions, relatively to the mildly deformed eastern areas. Blind thrusting and related folding in the MHZ continued in the Early Miocene. Thrusting and gentle folding in the MHZ partly continued in the earliest Pannonian, and was followed by sinistral movements in the whole MHZ, with maximal displacement along the Tóalmas zone. Late Pannonian inversion activated thrusts and generated transpressional movements along the Tóalmas zone. 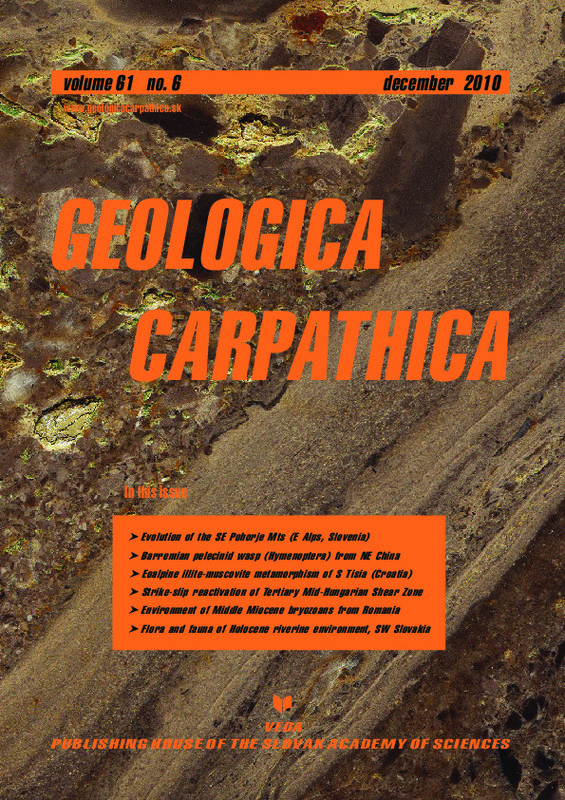 Abstract: The section of Garbova de Sus contains diverse fossil groups and rich bryozoan assemblages, with 77 species altogether. Several taxa have been recognized as very important in the assemblage and two new taxa are described in detail: Poricella garbovensis sp. nov. and Therenia transylvanica sp. nov. Foraminifera and calcareous nannofossil assemblages were used for biostratigraphic and paleoenvironmental interpretations. On the basis of sedimentological features and micropaleontological data, the sequence of paleoenvironments can be subdivided into two intervals indicating slightly different climatic conditions. Abstract: Zitny ostrov, the largest island of the Danube River (SW Slovakia) gained its present shape in the Neoholocene period. As a result of increased flood and geomorphological Danube river activity dated to 1378–1528 AD, the Lower Dudvah River was abandoned and its alluvium became a part of the Zitny ostrov. Study of a Dudvah terrestrialized paleomeander by means of pollen and macrofossil analysis provides new information about the paleoenvironments of the Danube Plain. The meander under study was cut-off during the Sub-Boreal period when the land was mostly covered by oak-dominated mixed forest with a notable high frequency of Fagus and Abies. In low-lying depressions, Alnus glutinosa formed typical alder carrs. The largest decline of the mixed forest occurred during the Sub-Atlantic period. Until the mid-19th century the region was strongly influenced by shallow groundwater and periodical floods, as reflected by pollen of aquatics and marsh species. Amongst non-arboreal taxa, pollen of Cyperaceae, Brassicaceae/Cuscuta, Poaceae and Apiaceae prevailed. Local successional changes started with i) stage of abandoned oxbow still with influx of moving water, poor in both macrophytes and molluscs, ii) shallow eutrophic oxbow lake with slowly flowing or stagnant water overgrown with aquatics (Ranunculus subgen. Batrachium, Potamogeton sp., Ceratophyllum demersum etc.) and abundant molluscs, iii) an open marsh dominated by Cyperaceae (mainly Carex riparia) with Atriplex prostrata, supporting diverse molluscan and Ostracod fauna. Present-day habitat is a result of landscape changes, which have been associated with draining, intensified agriculture, ruderalisation and spread of invasive species.